This is lovely. Might be nice to add a bit of a puzzle component to it, i.e. you have to travel the local stars in a certain order to unlock others. I love the world of this one. It's like being invited to wander around in a living painting. 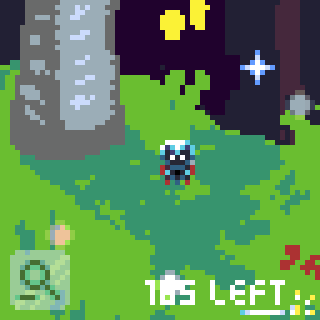 So far, it's my favorite game of this year's LOWREZJAM. Was backtracking a lot to find missing stars, which got me to peruse the environments over and over again, which I enjoyed. Also, as others have said, maybe there could be more incentive to play in close-up mode? I tried to play in it as much as I could to experience the artwork, but I ended up playing zoomed out a lot to make collecting stars more efficient. I've gotten some feedback expressing difficulty with collecting the last few stars - and I agree with them entirely. 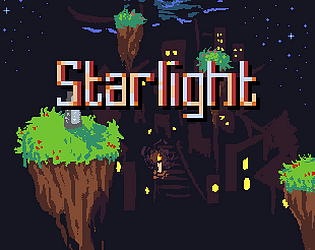 This game is about exploring the environment and hunting down the stars to light up, but I don't want it to be incredibly tedious to reach the ending, either. In light of that, I will be uploading an updated build later on to relax the requirements for seeing the ending (though people who want to collect all of the stars will still be able to). 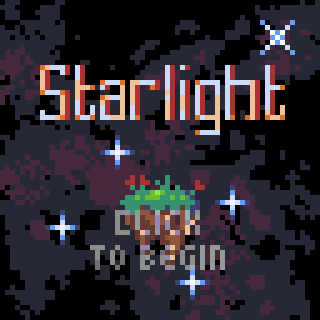 In the spirit of the game jam, though, I won't edit the game until after the judging period is over (unless that kind of thing is accepted in this jam). Thank you for all the feedback thus far. I enjoyed that, it was a nice thoughtful break. The music was beautiful, and I enjoyed the art too. Having said that, this game is probably too much to ask from a game jam audience. I went back and forth 3 times and still managed to come up 2 stars short and had no clue where to go next, so I quit before I saw an ending, which makes me sad. I'd recommend either going to a free moving mechanic (the tap to move is particularly tiring on a trackpad), or halving the number of points you need to tell the whole story. Interesting and wistful feeling to the storyline. I ended up playing the whole thing in zoomed-out mode, though, because there's no reason not to, which means that I miss out on some of the graphics. There's also a dull feeling of resentment when you've got most but not all of the stars, because walking back around the whole map pixel-hunting -- pixel-hunting here is the point -- just makes me think "I should have done a manual depth-first search", which breaks the immersion because I'm thinking about algorithms to solve the game, not having fun doing it.